The job of the photojournalist is to establish trust with the subject, to make a connection no matter what the circumstances. Few do that as well as John Partipilo. The Nashvillian spent a decade in Los Angeles shooting for Time-Life, Newsweek, The New York Times and People Magazine. In 1998, he was lured from an Arkansas newspaper to Nashville to work as a staff photographer for the Tennessean. Before attempting a photo series on the Mennonite population in Middle Tennessee, he knew he had to get permission first, as this is a group is not exactly fans of technology – or vanity. “I will sit down with them and talk to them and put them at ease long before I pull the camera out because, seriously, photographers are not a normal thing in people’s lives. People trust me; that is how I get access,” Partipilo says, explaining his process. Partipilo’s latest collection is a stunning, fine-art photographic essay from three trips to Cuba between May 2016 and March 2017. His work, “Cuba: My World Ends Here,’’ chronicles those trips. Nashville Arts Magazine sponsored the photojournalist’s “Cuba work” as their artist of the week, displaying his work on the eye-catching billboard looming above the West End split. Before concentrating on life in Cuba, Partipilo spent two decades photographing a mosaic of news, crime, trends, movers and shakers (and some ne’er do wells) – the spectrum that makes up the fabric and the zeitgeist of Middle Tennessee. He left his staff job at the Tennessean in 2015 to work on his own but not before making a name as a gifted chronicler of people and places, as well as being easy to work with. 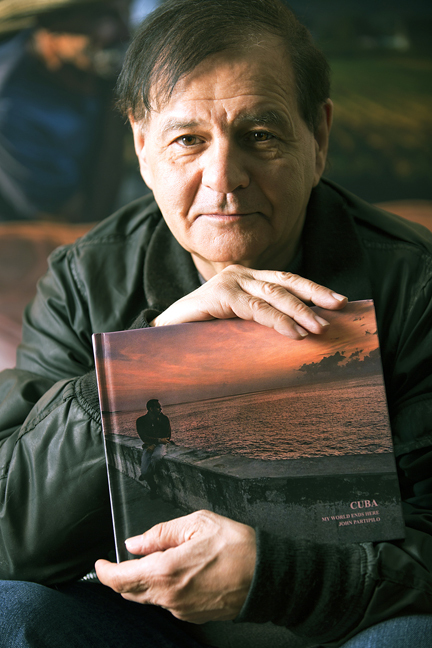 Photographer John Partipilo holds his new book titled, "Cuba, My World Ends Here." Partipilo has two Pulitzer Prize nominations. His first was for a series on sharecropping for the Arkansas Gazette in the late 1970s. The second was a team nod to the Tennessean for the overall work the newspaper did on the historic May 2010 flood, during which Partipilo waded hip deep through muddy flood waters to capture the devastation. Partipilo’s deeply human work packs the kind of emotional punch that words don’t convey; his image of a man weeping while navigating his neighborhood by canoe needs little explanation. Partipilo has a unique “origin story” on his passion for shooting – and probably truth-telling – that involves sneaking a Brownie Hawkeye camera into his Catholic elementary school in Illinois to document the spanking of the kids by the nuns. 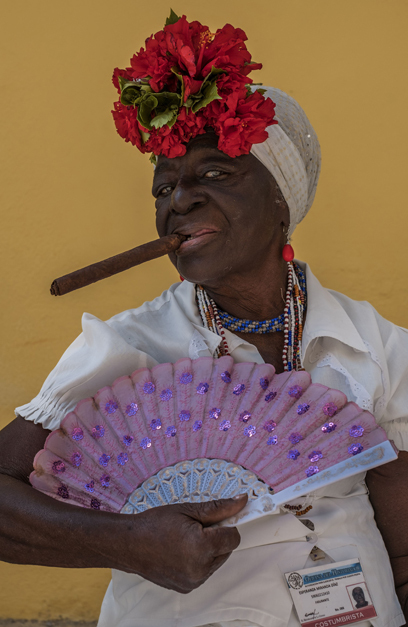 Nashville photographer John Partipilo’s solo fine art photography exhibition, Cuba: People in Transition, will be held at the O’More College of Design April 6-30. The photographic display was curated by Beth Inglish. The opening of the exhibit is April 6, 6-9 p.m., with an artist talk with Nashville Arts Magazine editor, Paul Polycarpou at 7 p.m. 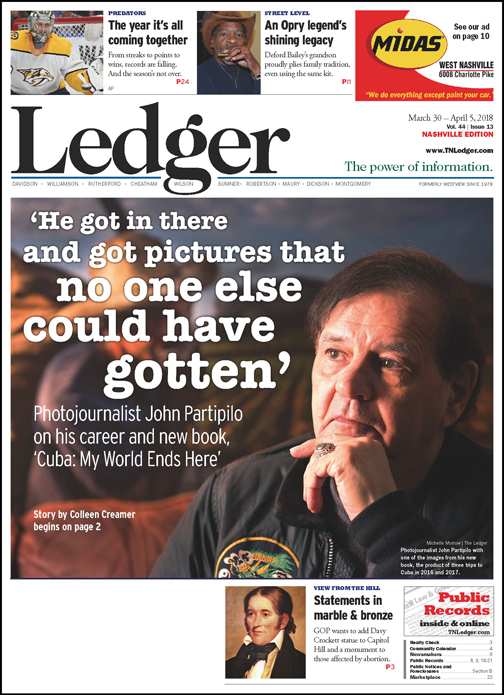 Immediately following the talk, Partipilo will host a book signing for “Cuba: My World Ends Here,’’ a photographic essay of his two shooting treks to the island. For nearly 60 years, only 90 miles off the coast of the United States, Cuba has been isolated from most Americans. 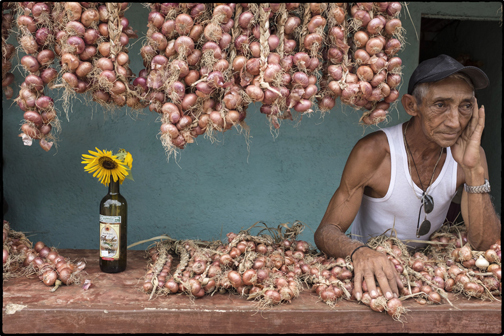 "Cuba: People in Transition" is a photographic essay and an inside look into this long-shrouded country and the everyday life of its people. Information: www.johnpartipilocuba.eventbrite.com or Beth Inglish, www.beth@bethinglish.com, 615 739-2337. The nuns, who confiscated the camera and the film, were not impressed with Partipilo’s sense of fair play, but his mother was. She urged him to continue to pursue whatever he was passionate about. Partipilo is able to shoot and assemble images that are at once difficult to look at and nearly impossible to look away from. His style is photojournalistic, but his images fall under the category of fine art because of their level of technicality and artistic expression, color shots that are strong in composition and vibrancy, and black-and-white images so tonally rich they look as though they may have been done in an entirely different medium. Partipilo’s six-month deep dive into the growing gang problem in Nashville for the Tennessean earned the veteran photographer Best of Photojournalism from the National Press Photographer’s Association and First Place from NPPA for Multiple Feature in 2011. He pitched it and his editors gave him free rein. That a number of gangs had been active in Middle Tennessee and recruiting in high schools took a lot of people by surprise, Partipilo remembers. He gained access to the gang Sur 13 when he befriended a female gang member while they were both in the back of a squad car. He was riding along with the Nashville Police Department’s gang unit, and she was heading to the station to answer some questions. Partipilo handed her a bottle of water, knowing she was thirsty, and then slipped her his business card. “She told me ‘They are never going to talk to you,’” Partipilo recalls. Later he would get a call that would open doors for him. Sutherland says Partipilo has a unique ability to gain access when access is difficult because of his approach. Partipilo’s image from that series of a murdered African-American girl lying in an open casket with her mother leaning over her makes the viewer feel almost like an interloper; it is at once sad and intimate. But Partipilo is rarely an interloper; his respect for his subjects is sincere, and they come to understand that. He says he likes to stay in the background while out and observing until he sees a compelling shot. “My process is like a Zen thing,” Partipilo says. “I sort of walk around and try not to think about it and just react to things that happen in front of me and, because I think that way, I think more serendipitous moments appear. I went to art school; I didn’t go to school for photography, so I still have concepts of art that I bring to this. I think that is why I see differently. It helps that Partipilo shoots every day, rain or shine, greatly enhancing his “luck,” his chances of being in the right place at the right time. During two tours embedded with U.S. troops in Iraq in 2003 and 2004 for the Tennessean, Partipilo ate, flew and slept in blown-out buildings with the troops – and he almost got killed on the first deployment but not before he was warned, according to Sutherland. Partipilo’s version is similar – to a point. His second deployment, his idea, was to embed with the 101st Airborne Division for a few months and then track them as they returned home, finally, to Fort Campbell. Partipilo grew up in “mainly” in Arkansas and Illinois. He has sometimes been classified as a human-rights photographer based on his penchant for being in the right place at the right time as situations are heating up. He has chronicled the Women’s March, the anti-Trump movement, protests for and against DACA [Deferred Action for Childhood Arrivals] and the impact the 2008 housing crash had on the hungry and the homeless in Tennessee. He shot a long-form series on rural Tennessee while working for the Tennessean. 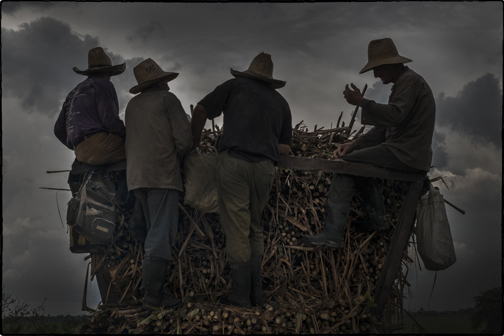 The six-month photographic essay documented the changing landscape of traditions in the hinterland. He found and covered working cowboys – willing to talk – functioning church congregations from previous centuries, the last wooden post office in Middle Tennessee, tobacco farmers who had gone out of business, and county fairs that have stayed just as they were in the Fifties. The series won a Gannett [the parent company of The Tennessean] Visual Journalist award in 2013. 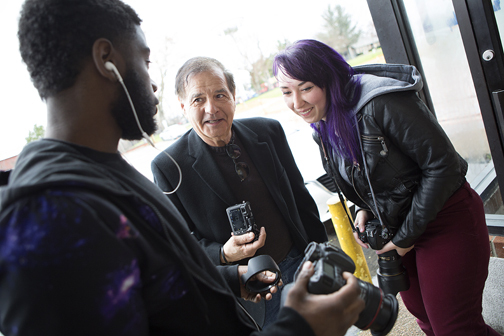 Students Joshijah Spence, left, and Gabriella Karademosget get feedback from John Partipilo during a photo shoot. They are Partipilo’s students at Nossi College of Art. Another project Partipilo lobbied for and brought to fruition for the Tennessean was “A Long Road,” a documentary on Ralph Meacham, one of the last sheep farmers in the region who was singlehandedly attempting to keep alive that sliver of the old ways and who let Partipilo track his daily life until the day he died from ALS. The Mennonites, the homeless population of Tent City, families of those who have been murdered, Nashville’s Hispanic population, and the Kurds – Nashville has the largest Kurdish population in the U.S. – have all been subjects of Partipilo’s unearthing. The series on Middle Tennessee Kurds won Partipilo First Place from the National Print Photographers Association. While on assignment for the story on the local Kurdish population, Partipilo met a Kurdish man who helped him on background for the story and who he later met up with when he was embedded in Iraq. At Nossi College of Art’s Bachelor of Graphic Arts Commercial Photography program where Partipilo teaches, a class in photojournalism is required of all students whether they are preparing to do commercial work or investigative journalism because photojournalism requires students to be quick on their feet, Partipilo says. It can act as a bedrock. Tom Stanford, photography coordinator at Nossi, says Partipilo gets his students out, and often, out of their comfort zone. Former student Kathleen Munkel, who was heading into a career in photojournalism when she took Partipilo’s class, says the spirit of the class was nearly as important as the letter of the class. Northern Spain’s Basque population, and their unique culture, is on Partipilo’s calendar for this coming spring. Partipilo may again find himself in the midst of some unrest when he heads there as the Basque, along with the Catalans to the east – who recently have urged their secession from Spain – have long wanted to be their own country, though that is not the reason he is going. The reason he is going is because he can. “I think they [The Basque] get eclipsed somehow, but it’s a really an interesting culture because of the blending of French and Spanish,” Partipilo says.